It is clear that I was an arsonist in a previous life. I love fire. I love cooking. So cooking with fire...that is the best. Let's start at the beginning. In the beginning man cooked meat over an open flame. He survived, so really, how hard can it be? Well, harder than one might imagine. There is fire, but what kind of fire? Charcoal? Wood? What kind of wood? What kind of fire container? There are wood ovens, campfires, grills, big green eggs. Yes, meat is the obvious but what about breads and vegetables and seafood, oh my! This is where Mary Karlin and Wood-Fired Cooking comes in. She has answers to all these questions. If they are not in the book, there are many answers at her web site, Elements of Taste. There you can also sign up for special cooking classes and find the most eco-friendly charcoal among other things. The book provides several cooking options depending upon each individual cooking nerd. (I mean that in a nice way, but if you have a roasting box and a big green egg invite me over!) Here is Karlin offering several ways to cook a duck or a chicken. To make the brine, combine the water, tea leaves, ginger, and star anise in a saucepan and bring to a boil. Remove from the heat and let steep for 30 minutes. In a large nonreactive container, combine the steeped tea, soy sauce, and honey and stir until the honey is dissolved. Refrigerate for 1 hour. Add the bird(s) to the brine; refrigerate ducks for 4 hours, chicken for 6 hours. Keep the bird(s) submerged by placing a plate on top to weight down and at a temperature of not more than 40°F (4°C). Remove from the brine 1 hour before cooking. Rinse and pat dry. Prepare a medium-hot fire 400°F (200°C) in a wood-fired oven or cooker. To make the basting sauce, combine all the ingredients in a bowl and stir until the honey is dissolved. To roast in a box roaster, place the bird(s) breast side down on a wire roasting rack in a roasting pan or clay baker and baste with the basting sauce. Light the charwood once the bird(s) is in place. Roast, covered, with indirect heat for 1 hour. Being careful not to pierce the skin, turn over, baste, and roast for 30 to 45 minutes, or until an instant-read thermometer inserted in a thigh registers 175° to 180°F (79°C to 82°C). To roast in a wood-fired oven or ceramic cooker such as a Big Green Egg, place the bird(s) breast side down in a roasting pan and baste with the basting sauce. Roast for 1 hour. Being careful not to pierce the skin, turn over, baste, and roast for 30 to 45 minutes, or until an instant-read thermometer inserted in a thigh registers 175° to 180°F (79°C to 82°C). Let sit for 10 minutes before carving and serving. Birds and fire...what a great combo. 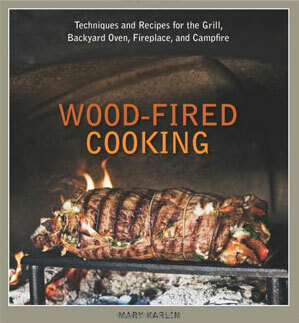 If you are looking to get yourself or someone you know a "barbecue' book for summer, grab a copy of Wood-Fired Cooking. The food will be better for it.